Well, we all have them. 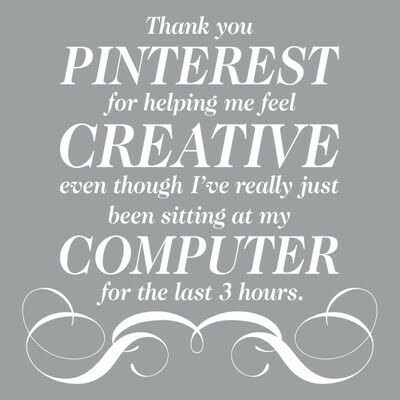 All of us who are members of that slightly quirky Pinterest community, that is. Mine is called to make. 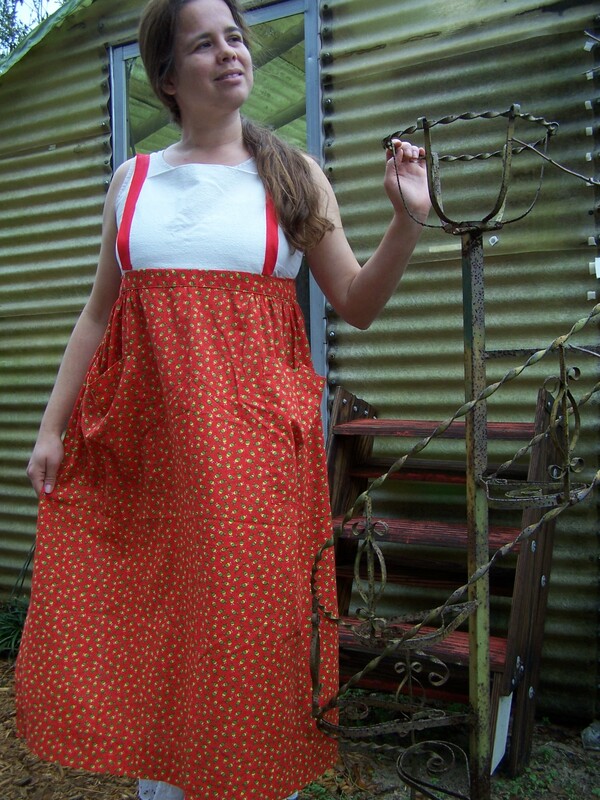 My sister has one called to make, to do, to wear…or something like that. Yours is probably called this is a great idea and I’ll do it some other time when I’m not browsing pinterest…or something like that. The point is: we all have found some truly wonderful project ideas on Pinterest, or elsewhere on the interwebs. All it takes is a little bit of focus to get those projects rolling! So…I’m starting this project for myself, if not for anyone else. It’s a challenge to accomplish one project from Pinterest each week! Yes, I know that I already have one project that I write about each week. This may or may not be a different project! I just want to take some of those fun ideas and make them my own. So many unique things…just waiting to be done. Won’t you join me? 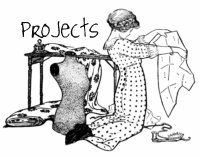 The Pinterest Project Challenge group is open to all members who would like to join. Just ask and I will add you to the group or send you an invite. Hey, if you don’t want to deal with the hassle of a new website, just send me a link to your project and I’ll add it to the group and/or share it right here–on the blog. I’ve already begun adding projects to the pinboard. These are some ideas that I really think I can accomplish. I hope you’ll join in on this neat (I think) challenge. I look forward to seeing what we all create! As for Georgette Heyer, still a huge fan. Should you come across any of her novels, you really should give them a read! The last few weeks have seen a marked increase in my viewing and reading Regency romances. If you’ve yet to hear of Georgette Heyer, you should hie thee to Amazon and do your best to find a compendium of her works. I suggest Cotillion and Arabella as two of my favorites so far. Silence, if you’re reading this, I still hold you responsible for my love affair with Heyer’s works! Here’s an interesting bit of trivia I read about Georgette Heyer the other day. I was hoping to find some of her sweet books made into movies and was only able to find two–The Reluctant Widow and another whose name I cannot remember. I did a bit more searching and came upon an explanation for the dearth of Heyer movies. Upon watching the film version of The Reluctant Widow, Heyer immediately put a clause in her will/business papers/whatever it was that said no other of her books could EVER be made into movies! How’s that for a vote of confidence??!! But, enough of this Georgette Heyer fol-de-rol. 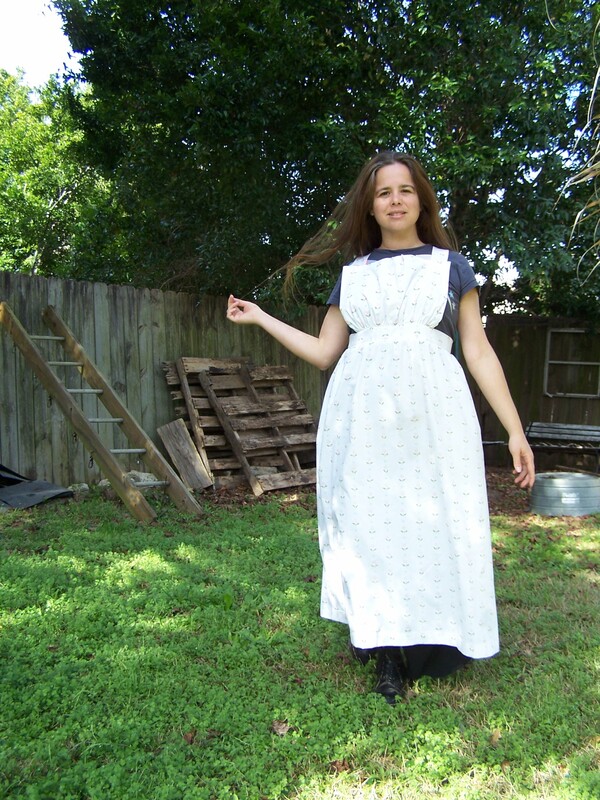 You’re here because you want to know about making a Regency apron! How did I do it? For my third try, I looked askance at my sheet(s) of directions and went to work on an apron that more closely resembled what I wanted. I shortened the over the bust measurement, narrowed the skirt and did not gather it as much. 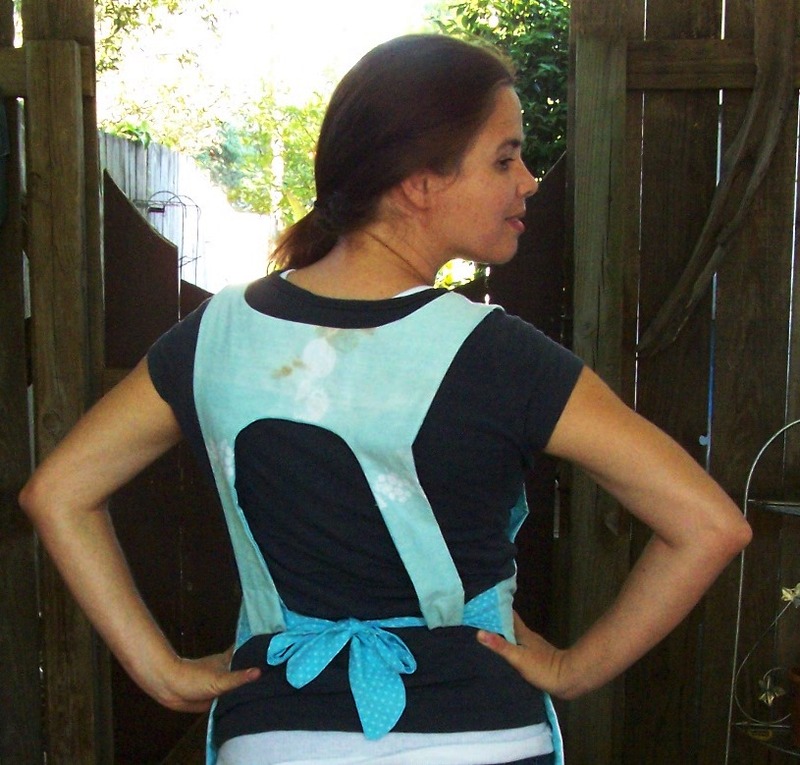 I also gathered the bottom portion of the bib, to give the apron more of a romantic (and flattering) look. The waistband and straps stayed pretty much the same. I used a pretty vintage sheet for which I had no other use. The result? Just want I want except I’ll need to change the angle of the bust a tiny bit for the next model! 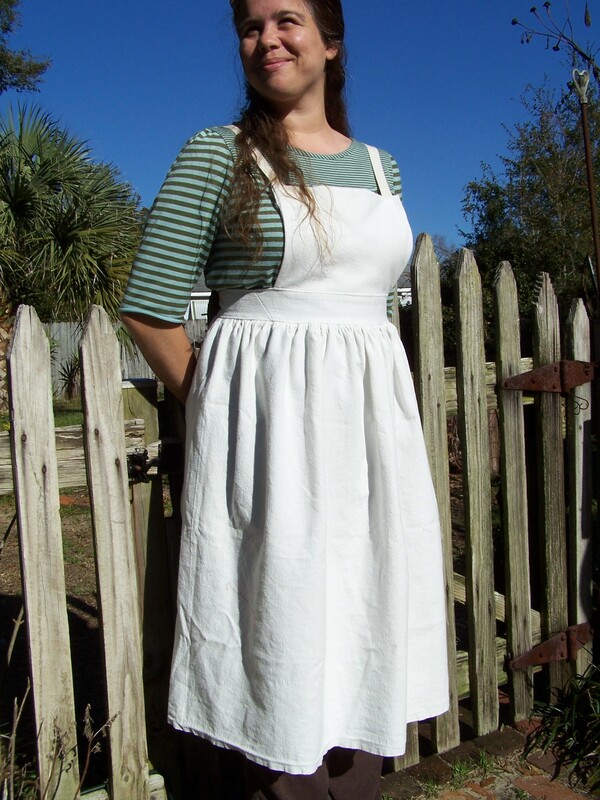 And since I was feeling particularly creative this day, the buttonholes are hand bound and the apron is hemmed by hand. The rest is machine sewn but I am ecstatic about sewing my own buttonholes. Sewing nerd=me. For those of you who may be feeling slightly jealous by the obviously beautiful day we were having when I took these photos–don’t worry. The heat’s back on and the day is gray, gray, gray. This week’s project is quite a departure from what I thought I had planned, but I am so thankful for getting this one started! Some of you may find this article a trifle boring, but I’ve come to the conclusion that I just can’t stand living in a cluttered, dirty and dusty space! 🙂 So, my project for this week was, quite simply, to do something about it. My sister and I recently were discussing ways to keep ourselves motivated with house cleaning and other projects, so I thought this website may have something interesting to offer. Well, it does. Despite the exclusionary name of Just Mommies, I located lots of great tips for helping me keep the house clean and organized. Let me tell you: I need every single tip I can get. 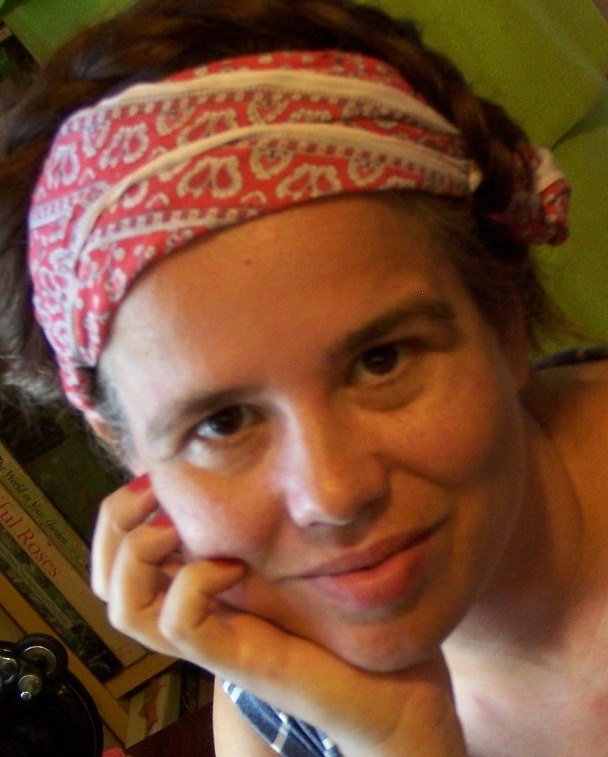 I know that some of you are very likely born organizers and keeping a tidy house is like breathing (hi Tracy!) to you. Others of us need a little push and some help to know exactly what to do. That’s why I enjoyed finding this website so much. I was able to print out a really helpful monthly schedule of house cleaning chores. It’s broken down into general and specific activities for each day PLUS a master plan for a different room of the house each month! Can I tell you how surprised I was at some of the items on that calendar?? I never knew that baseboards should be cleaned once a month! I’ve been known to let my ceiling fans breed their own special variety of dust. I only think about them when they’re not working! The lace curtains in the living room have not been washed in I have no idea how long and were disgraceful. That being said, this week’s project has been an overhaul of my house cleaning system. I spent several hours of each day last week dusting, scrubbing and washing various items around the house. I have polished furniture, cleaned windows and terrariums, mopped, cleaned baseboards, put away abandoned projects (of which there are legion) and decluttered until I actually feel like I may be getting somewhere! I won’t prattle on forever about my new cleaning habits, just wanted to let you in on this week’s project. I’m decluttering. I’m cleaning and I’m learning to be disciplined in my work. I hope next week’s project will be a little more fun: it’s always easier and more pleasant for me to create in a clean and orderly environment. When did you learn how to keep a clean home? Were you in college, later in life or were you just born that way :)? I’ll let you in on a little secret: I have a thing for vintage tablecloths. A big thing. 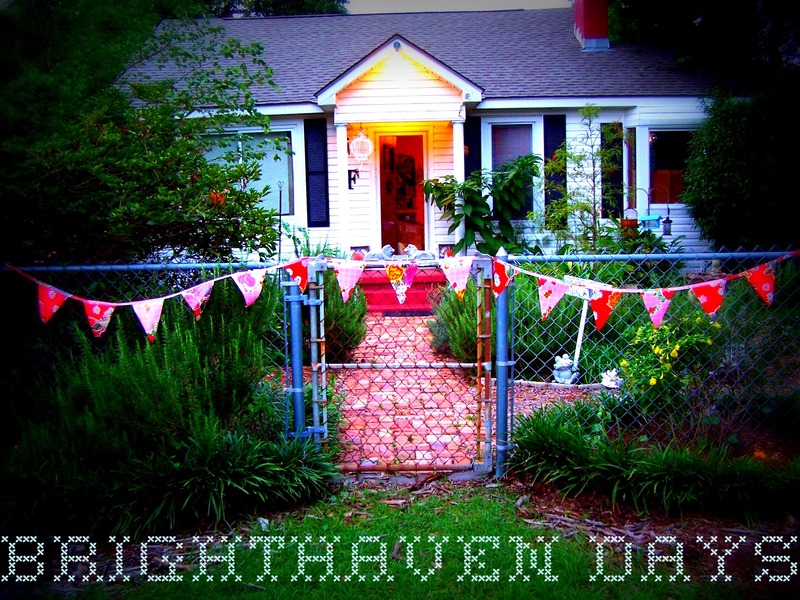 One of my friends has a mantra for me when we go thrifting together: no tablecloths! Of course, I don’t let that stop me. I love the flowers and the fruit. I love the kitschy and the plain. I love the great condition…and the not so great condition. Until recently, I never had a good plan for the tablecloths that were simply too far gone to use. 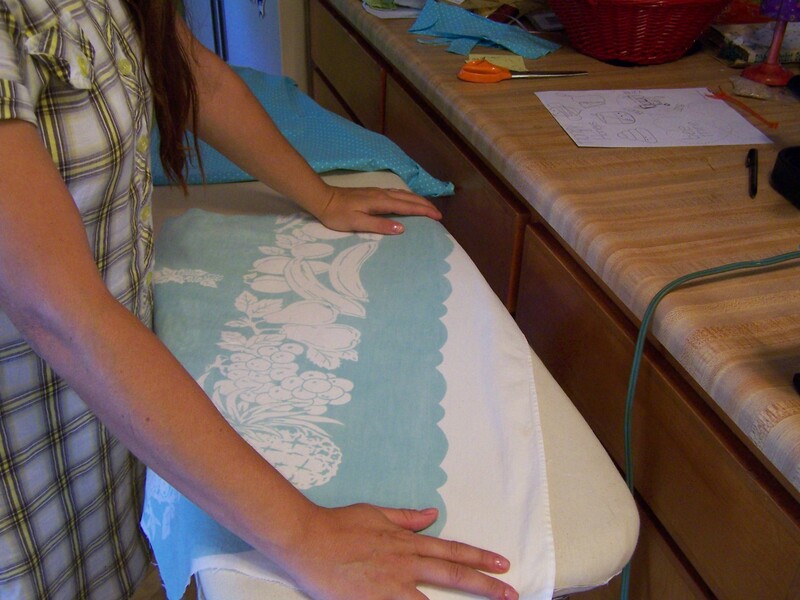 Last week, at one of our regular thrift stores, I was given a lovely aqua and fruit print tablecloth. The catch? It looked like someone had spilled furniture polish all over it! So sad. 😦 There was a large salvageable area, so I brought the cloth home with the idea of making it into something new and useful. Since last week’s project, I have really been feeling more adventurous in my creation skills, so I decided to make an apron from the parts of the tablecloth that could be saved. 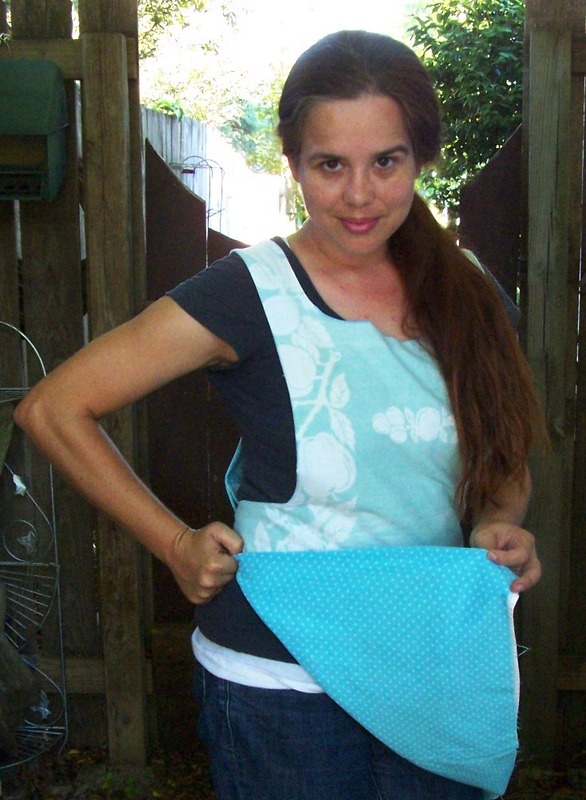 It’s a simple apron pattern that I have made many times before, so I was not in the least bit concerned about the construction. 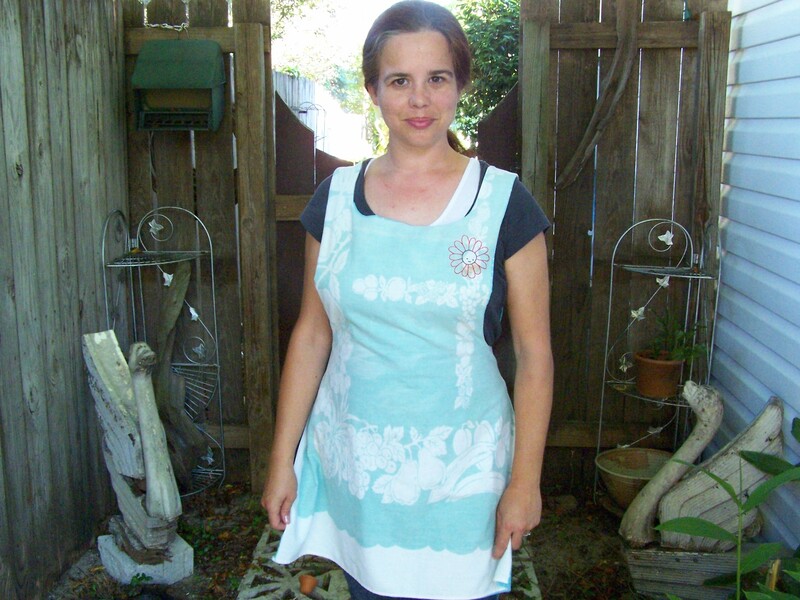 To embellish the apron…and to cover up one of the stains on the print…I used another Wild Olive design–a happy little daisy face! I simply traced the lines of the design, turned the paper over onto the fabric and pressed with a hot iron for a few seconds. Voila! Once the two sides were sewn together, I hand stitched all of the remaining openings (while watching America’s Next Top Model), so as not to have any unfinished seams that would keep the little apron from looking cute either way it was worn. I must admit, I am more impressed with my tiny hand stitches than with any other part of the garment. It’s not something I’ve done often and I’m very pleased with the results. Alas, no photos of the hand stitching! All in all, it was great to have a deadline for the project, as it ensured a finish time. I’m still toying with the addition of some rickrack, but may or may not do it. 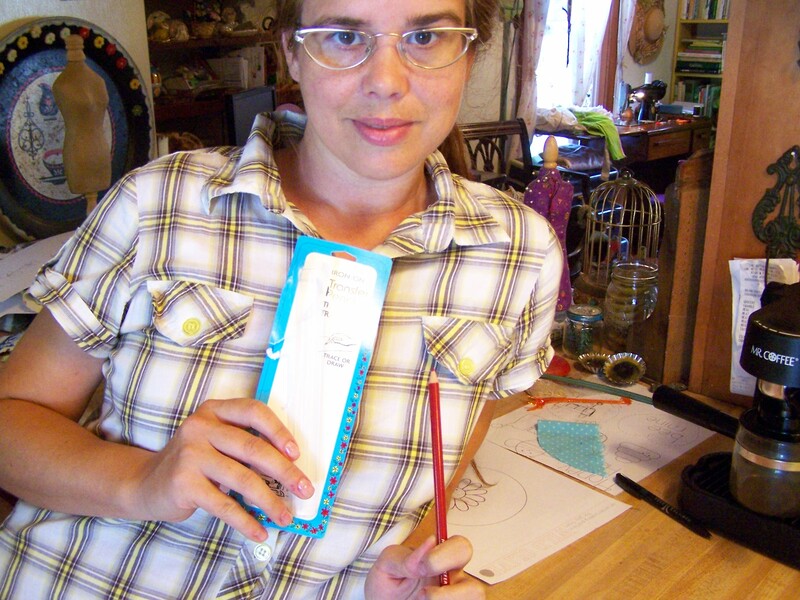 I already have some ideas for next week’s project (and I’ve begun working on one of them!) but we’ll just have to see what makes it into the blog project queue! What projects are you working on these days? Welcome to the creation discussion! No, we’re not discussing that creation. I want to talk about something I made this week! This isn’t a new project I’m announcing. It’s a 100% finished, washed and worn project that I couldn’t be happier with completing! 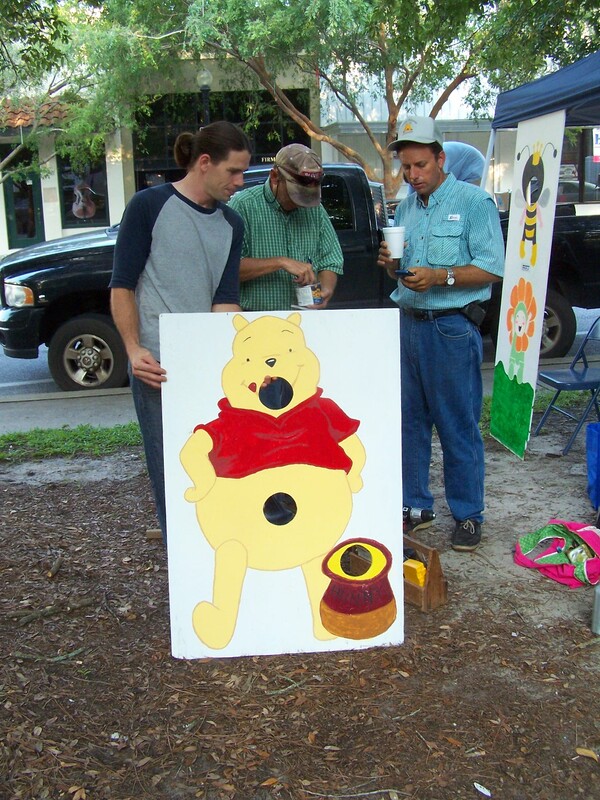 Some of you may know that we celebrated National Honeybee Day last Saturday. It was a great event and James and I stayed up until 2 AM the day of making sure we were absolutely ready to go! James constructed an adorable Winnie the Pooh beanbag toss game (I supplied the beanbags) AND he made an amazing photo board. Not to be outdone, I decorated my very own honeybee t-shirt! 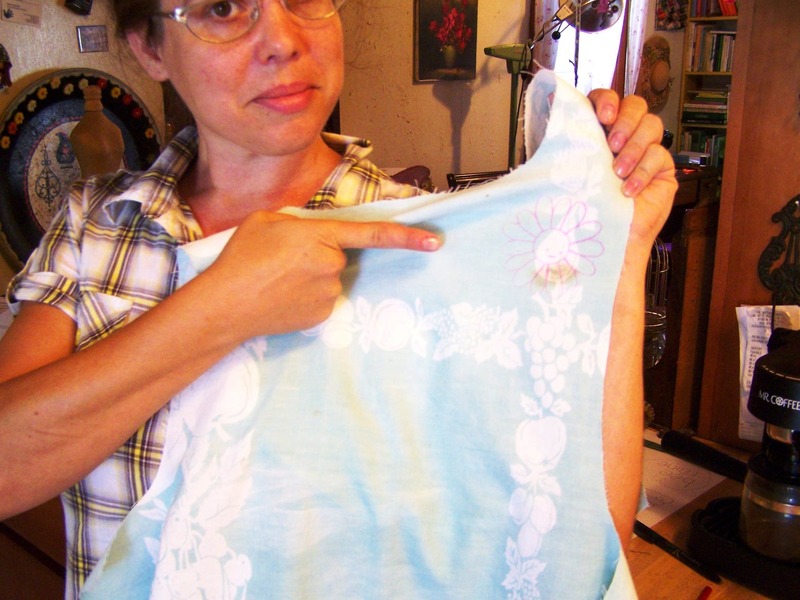 About a week ago, I contacted Mollie at Wild Olive about a honeybee pattern I was hoping to find. She sent me the most adorable set of “Honey Honeys” I have ever seen. Although the pattern was originally only for embroidery, I decided that my limited embroidery skills would be better utilized on an even simpler project. 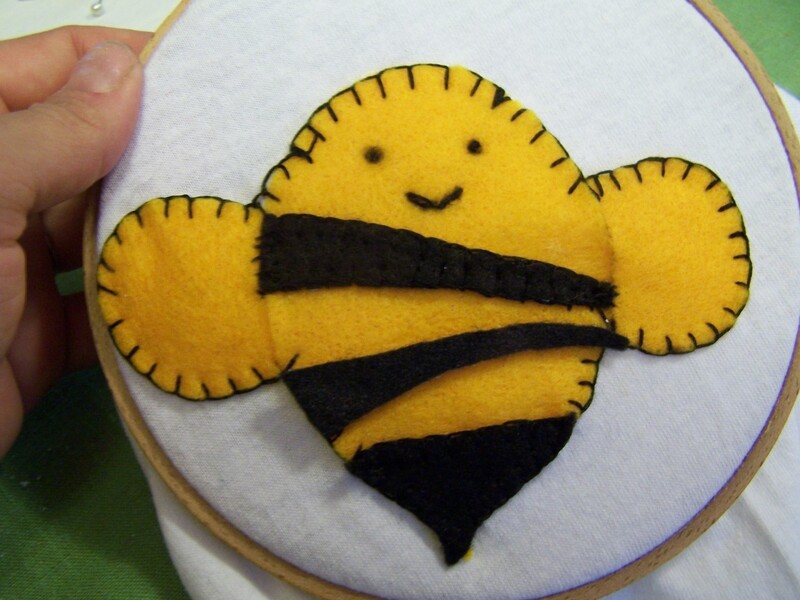 So, what I did was to enlarge the honeybee pattern and cut it out of felt! Unfortunately, I didn’t have any of that fancy felt that I know lots of you use. I had come across some gold and black synthetic felt at one of the thrift stores and decided to put it to use! So, I took the enlarged pattern and cut out the body of the honeybee in gold. Using a very simple blanket stitch, I attached the felt wings and body onto a plain white t-shirt. Then, I cut and blanket stitched the black stripes onto the honeybee body. To finish off the honeybee, I used a triple french knot for the eyes and a modified detached chain for the cute little mouth! I tried to make the french knot without really knowing what I was doing and then remembered that Mollie had written an excellent tutorial on making faces! Once I read the simple instructions there, I was good to go! I finished off Ms. Honeybee with some cute antennae and a flight trail. I thought the flight trail was a vaguely inspired piece of genius. 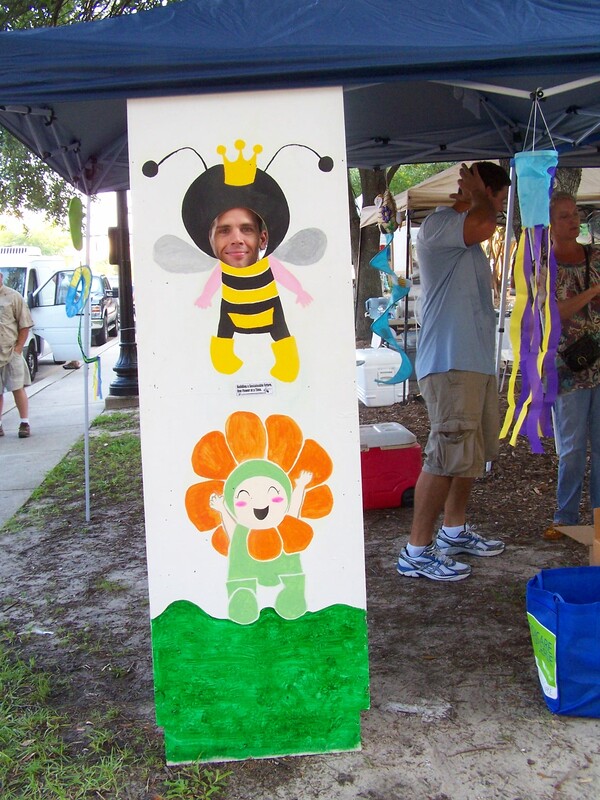 It turns out that more than one person thought I was sporting a honeybee kite–but, oh well! I think a honeybee kite would be pretty stinking cute. The flight trail was constructed of baby black rick rack and was most definitely the most difficult part of the project. I wanted the rick rack to resemble a cartoonish bee flight path, which I think it does. However, since I was attaching it to t-shirt material, I had to be really careful not to stretch out the shirt and keep the shape of the loop at the same time! 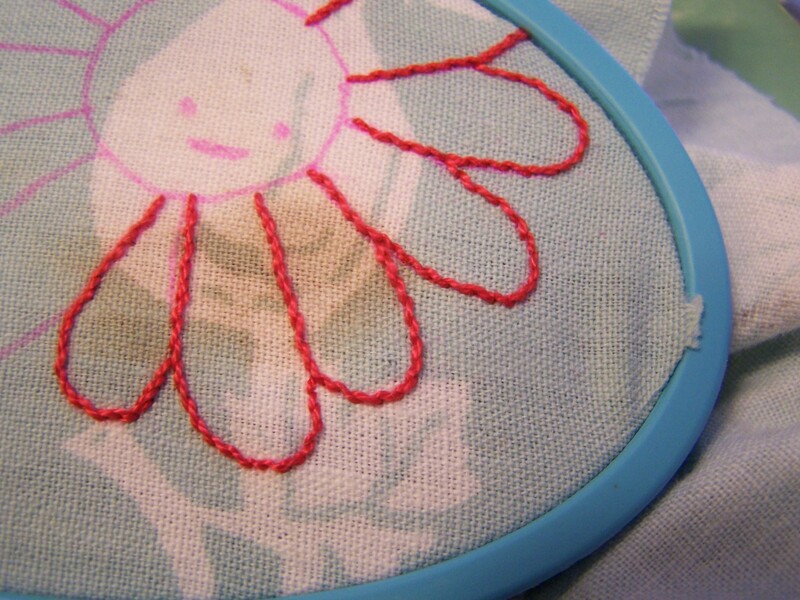 I initially started out with a running stitch and eventually just used a tacking stitch to secure the trim. I’m not sure how it could have been any easier but if anyone has any ideas, I’m definitely open to suggestions! So, my newest project is figuring out the kinks in this couch that we recently bought. We’ll be hosting a microchurch here at BrightHaven, so we thought extra seating would be nice. Plus, I’ve had my eye on this lovely couch for several months now (at a local thrift store, watching the price drop steadily). When it finally hit an acceptable price for us, we snapped it up! Plus, it goes so well with our other couch that it was a perfect fit for our home. Sure, I realize that this new project requires more effort than merely blogging about it. That’s where you, my lovely readers, tag surfers, friends and craftspeople come in. I’m not really sure what I’m doing. Okay, I don’t know what I’m doing at all. What I do know is that the couch troubles me a bit. So, I took apart one of the cushions to see if I could do anything about it. Seems the cushions are supplied with nice stainless steel springs (possibly something new as I took the seam apart where I could find it had already been taken apart??) Basically, these springs had compressed to give the cushion just a totally weird look and feel. The back of the seat was fairly elevated, meaning that if you sat, the incline tried to force the body downwards. Have I made it sound sufficiently awful? Once the hole was large enough to accommodate my arm, I began to feel around inside. Found some burlap, cotton stuffing, more upholstery cloth, springs and…grass? I found grass inside my couch? Does anyone know enough about early 20th century furniture construction to tell me the meaning of this? fig. c: grass in the couch?? What I’ve done now i shift around the stuffing and repositioned some type of burlap rope sort of thing so that the cushions will have better support. I’m about to go ahead and restitch everything. Does anyone have any further advice for me? I’m certainly willing to take it all apart again. Nothing ventured, nothing gained I say. By the way, if you can help us date this couch, that would be super awesome as well.